I’m making Tilapia for dinner. I’d forgotten I’d pulled it out of the freezer yesterday. C asked what’s for dinner tonight & when I told him I was making Banh Mi (Vietnamese sandwiches made with crispy layers of tofu, crunchy marinated veg, mayo and lots other stuff), he said, “…Um…” and gave me a look. I told him not to worry, there will plenty of other things to eat – like, fried things. I have half a bag of dumplings in the freezer still and another half a bag of edamame too. …Actually, now that I think of it, I don’t think C was all to keen on the dumplings last time. 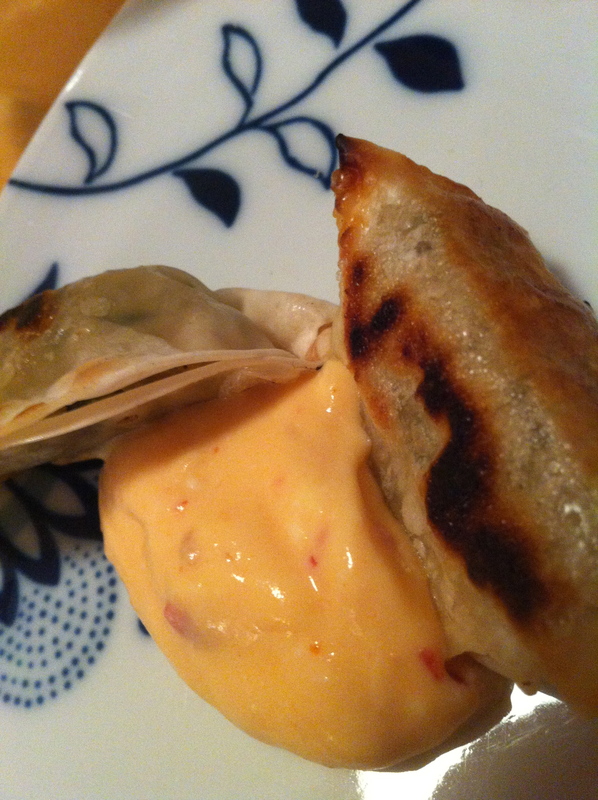 It was E that loved them – but that’s because I made a dipping sauce outta sour cream & Sweet Chili sauce. Give a kid some dipping sauce and watch them GO! So now I’ve got a pile of defrosting fish fillets for tonight’s dinner. I found a recipe on allrecipes.com that claims you can get crispy fish by baking them in the oven. 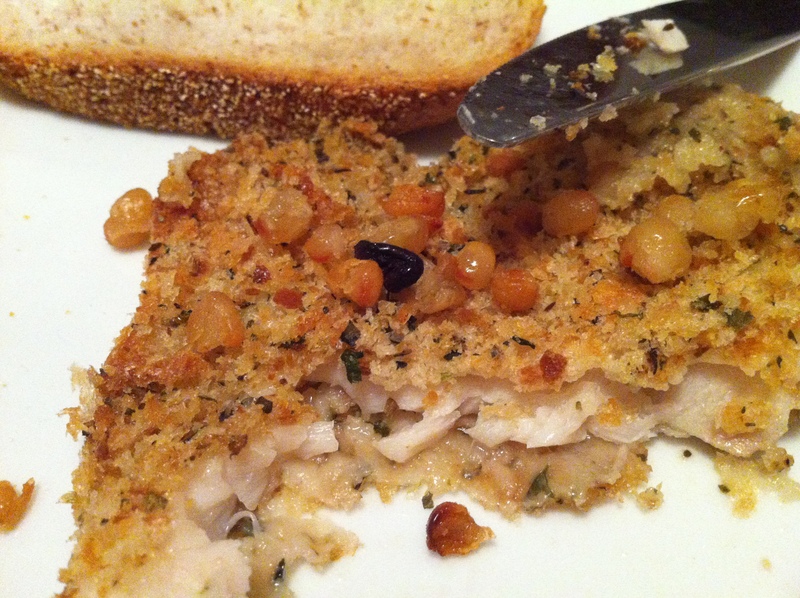 You dip fish fillets in milk – flour – milk – seasoned breadcrumbs, lay out on an oiled baking sheet and whack them into a 450ºF oven for 10-12 minutes. Huh, I thought. That sounds easy enough. I can *totally* do that. I looked at the clock – it was an hour or so until C brought E home from soccer practice…and babies were roaming around the house dismantling things… Ok. I saw on Food Network once that if you lay out things with crumbs for too long, the crumbs will get soggy. You fix it by laying out the fillets on drying racks set inside of/on top of baking sheets. I dunked-dipped-dunked-crumbed and laid the fillets out on a drying rack set over the aforementioned baking sheet. I think I sound snooty when I say aforementioned. In my head I have a bad British accent when I use that word. Ok. Fish prepped and set out on the drying rack for 30+ minutes til I heard from C that soccer practice was over and they’re headed home. I boiled the edamame (you just boil the frozen beans, rinse in cold water and salt them), threw a handful of the not-quite-frozen/not-completely-thawed dumplings into a non-stick pan with some olive oil and set them on med-low to crisp on all sides. I made some dipping sauce outta sour cream and sweet chili sauce (that sauce is A-MAY-ZING!!). Seriously, I buy whichever brand is the cheapest and I think this sauce is the bees knees. I usually get it in the sauce or dressing aisle, but sometimes it’s in the Chinese/Ethnic food section. I discovered the joy of Sweet Chili Sauce in Australia. They use it as a dipping sauce for FRENCH FRIES. God I love Australia. 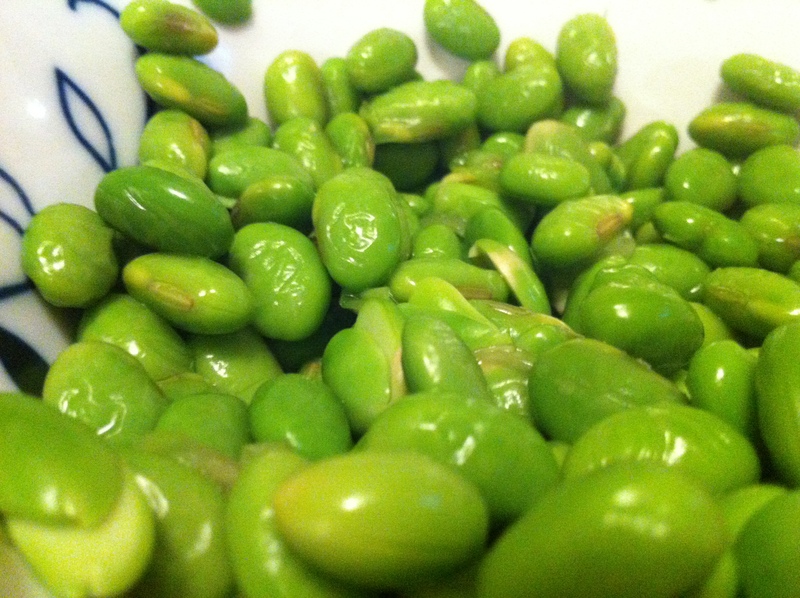 Edamame (boiled from frozen), dumplings (fried from frozen), and defrosted tilapia…. I’m sensing a theme here. Just before C & E walked through the door I checked on the fish. It was flaking but didn’t look crispy – so I threw the broiler on hi, moved the fish filled pan to the top rack and waited til the fish started turning a little brown on top. *I nearly forgot: the little crunchy looking things on top are actually a can of drained and rinsed ‘small white beans’ that I tossed with olive oil and threw in the oven at 450 for about 20 minutes. They don’t have much of a flavor, really, but they’ve got a TERRIFIC crunch! Good Lord I can’t resist. The pull is too strong. I made the dough and filling today, I’ll roll batch #1 tomorrow. I can already feel my thighs expanding and my tastebuds singing. Oh, and by the way, I totally **totally** cheated. I used potato flakes instead of making my own mashed potatoes. Here’s my secret: Fry an onion in a little oil and add a dash of sea salt and a couple of cranks of fresh pepper. No one will be able to tell. God Bless the onion. Next time (i.e. tomorrow) I’ll take photos of the new knishes. If they last long enough for me to grab my camera, that is. Did I mention that they’re wicked awesome good cold too? 1- Preheat oven to 450 degrees F. Spray baking sheet with vegetable cooking spray. 2- Dip fish into milk. Coat with flour and then dip in milk. Coat with breadcrumbs. 3- Place fish on baking sheet. Spray fish with vegetable cooking spray. 4- Bake for 10 minutes or until fish is done. Serve with tartar sauce. Here’s the link to the PRINTABLE Knish Recipe and the link to the original Smitten Kitchen Knish Recipe. 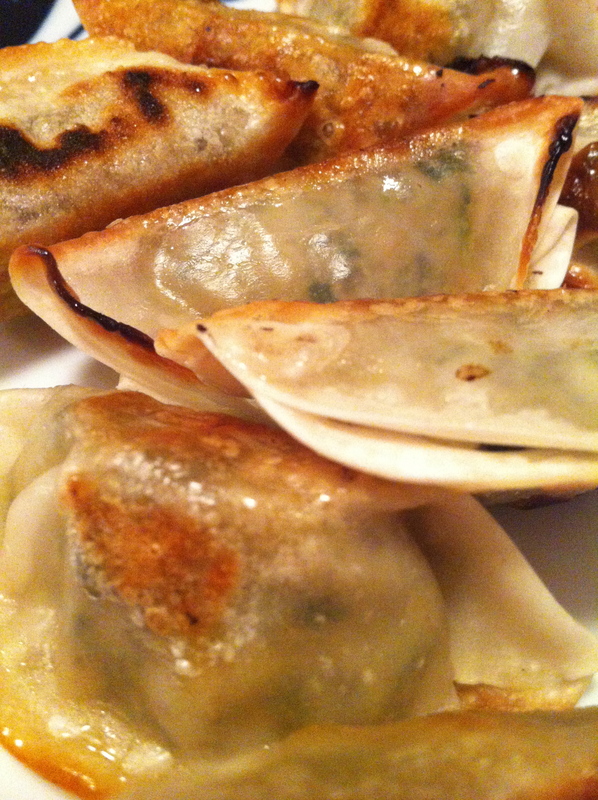 I’m not gonna bore you with directions on how to boil edamame or fry Dumplings. Seriously, all I did was follow the package directions. Sweet Chili-Sour Cream Sauce – ok. THAT I can give you. 1- Combine ingredients and stir well. 2- Dip stuff in the sauce.